All the main candidates have now responded to our Space for Cycling Bristol Mayoral manifesto. However, the level of measureable commitment varies! The next Bristol Mayor faces huge challenges in addressing our chronic problems of congestion and pollution. Support for cycling as a mass transport solution has huge public support as shown by the Bristol Bike Life 2015 report where 7 in 10 people want to see more spent on safer cycling infrastructure. Recent experience from London shows that investing in Space for Cycling not only increases road capcity overall, but motor traffic moves more freely. The Mayor of London has just published HUMAN STREETS: THE MAYOR’S VISION FOR CYCLING THREE YEARS ON where he says: “Our original painted lanes were revolutionary at the time. But knowing what I do now, we would have blasted ahead with our new segregated cycle lanes from the beginning”. The learning from the London Mayor applies just as much to Bristol “The key factor is political leadership. Everyone supports cycling – until it involves doing anything meaningful. … So for years in this country, we did half-hearted cycling schemes that upset nobody but also, bluntly, helped nobody and changed nothing”. 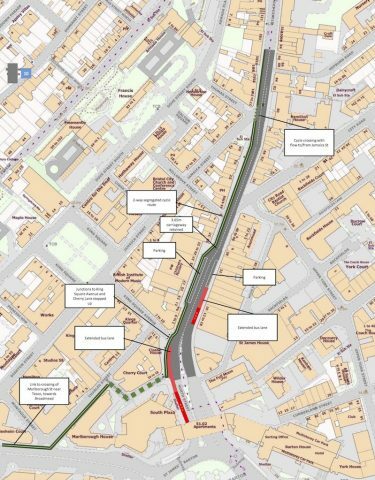 Will you create protected Space for Cycling on the Gloucester Rd? Will you support a Living Heart for Bristol by removing through motor traffic from Anchor Rd, Park St, Haymarket, Baldwin St and Prince St? Whatever the current level of commitment by each candidate whoever gets in will need give greater priority to cycling infrastructure (as London is successfully doing), walking and public transport if the city is to reduce the congestion and future proof the city as its population continues to grow. Every week in Bristol someone is either killed or seriously injured in road traffic incidents. If this happened on a building site it would be closed down. If one or two people were killed or injured at an amusement park there would be a HSE inquiry. On our roads these figures, and the pain and loss they represent, are accepted as the result of inevitable “accidents” rather than the predictable and avoidable incidents which they are. How can it be that 9 out of 10 cases will not be prosecuted, even when the police say the driver is at fault? Our Road Justice group has recently provided evidence to the parliamentary Transport Committee enquiry on road traffic law enforcement. This is following the Committee’s launch of the enquiry scrutinising the government’s policies to improve road safety. One of its items of reference “The impact of road traffic law enforcement on the safety of cyclists and pedestrians” is of obvious concern to us. Despite very short notice, the Bristol Road Justice Group has made a submission to the Committee which can be viewed below. Our evidence drew on the work we have done highlighting the lack of enforcement in relation to incidents on the Gloucester Road and in relation to injuries caused by vehicle doorings (please see our Gloucester Road and Dooring articles). There are two main sources of information on road traffic incidents causing injury and involving cyclists; both have their strong and weak points. Police incident records, known as STATS19 reports, give a specific location for the incident and a brief, sometimes too brief, narrative on what happened. In many cases, from reading these reports, it is possible to work out who was at fault in an incident. We however know that there is a degree of underreporting and the police themselves have some concerns as to the accuracy of reports. They are used by the Council’s Highway and Transport Management department to plot the location of incidents on their mapping website, analyse trends and rank contributory factors. The Council’s Directorate of Public Health also produce figures for emergency admissions of Bristolians to hospital due to transport related “accidents” (their use of the term). Whilst these figures only cover Bristol residents and cover their travelling anywhere in the country, the findings are considered to be representative of incidents occurring in Bristol. Whilst thought to be more comprehensive than the police’s reports, incidents are not identifiable by street location and, while the STATS19 records identify the types of road user, they don’t identify the factors causing the road traffic injuries. So what do emergency admission stats tell us about cyclists and road traffic incidents in Bristol? 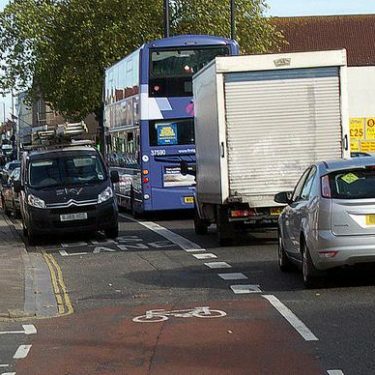 Who knew that Gloucester Road was a brilliantly successful cycle route? Numbers at peak times have doubled over the last decade while motor vehicle numbers have dropped by a fifth. We know this because traffic flow data from an annual census published online by the Office for National Statistics allow detailed analyses and comparisons for cycling levels on major routes at a local level. About 100 census points around the city are monitored for a full day and all forms of traffic are counted. See Cycling Trends in Bristol for more. If a road like this, with very poor provision for cycling, can show a steady increase in cycling over a sustained period we can be very confident that Bristol City Council is right in making cycling a significant part of its transport policy for the future. People are making a big effort to use bicycles, even on roads like this. This gives the Council an opportunity, and a responsibility, to respond in an even more confident terms than their new Cycle Strategy sets out. Bicycle travel has been going up steadily over ten years. It has doubled while car and taxi traffic has gone down by a fifth. Whatever the underlying causes, the message is clear: cycling can thrive in adverse conditions and if given proper space it could make a huge contribution to public health, to well being and to the economy of Bristol. This is not just a “cycling” thing for “cyclists”. The fact that so many people have been using this route while other modes of transport dwindle suggests a strong trend that wants to run. Ten years is hardly a fad. Ten years’ growth is significant and we think Bristol City Council has every right to feel and act very bullish about the future of cycling as a much bigger part of a greener and healthier future for the City.